This cabinet is a fully modern style design, causing optical illusions at first sight due to its simplicity, seeming like a decorative wall with multiple units inside. However, this simple décor is in fact a series of spacious cabinets providing the most service area for the family. The simple geometry is the chief attribute of this model and the modern style. Replacement of handles with electric magnets helps with the seamlessness of the model. 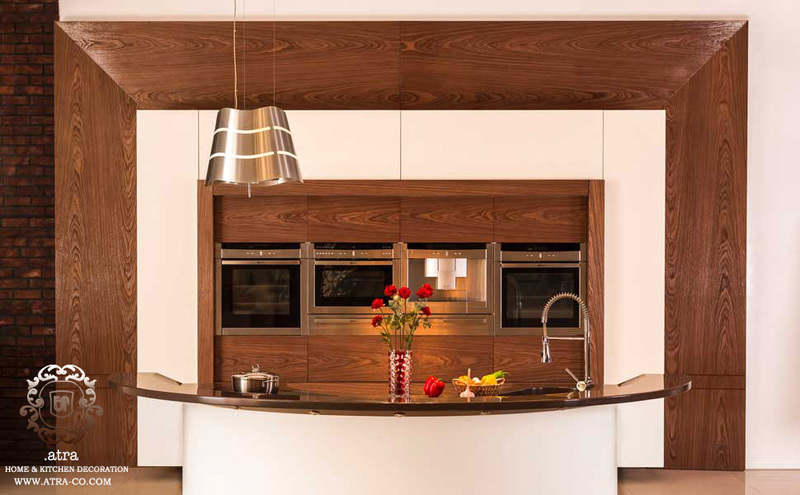 The material here is a mix of walnut tree Alpi veneer and acrylic. The combination of warm and cool materials gives off a splendid sense of balance of visual appeal. By sandblasting the walnut wood veneer and touching the warmth of wood, in addition to the simplicity of the design, a modern, relaxing atmosphere has been created (sandblasting results in embossed patterns and engravings, maximizing the appeal of the job). Among other attributes of the model is the curved counter, indicating the height of skill in corin application. 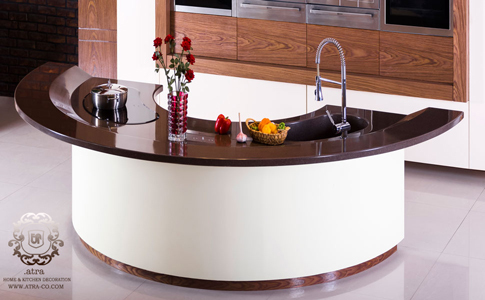 The seamless curved execution features a built-in sink with no gaps. Spot, moist resistance of corin is among the benefits of this synthetic rock. It’s easy to clean and simple to repair in case of damage.